#WalangPasok ADVISORY: 4:18 PM for August 27, 2014. According to Governor Juanito Victor "Jonvic" Remulla post on his social media account. Classes in All Levels on Cavite Province is suspended for Wednesday, August 27, 2014, due to possible Flooding in low lying areas. Read the updated list of schools with suspended classes below. PAGASA reports said that Floods hit Manila and other flood-prone portions as heavy rain fell over several parts of Luzon. Rain and Flooding are brought by LPA, it has a small chance of developing into a tropical cyclone, but it will bring rains over parts of the country. Bookmark this page or follow us on Facebook and Twitter for easy access. 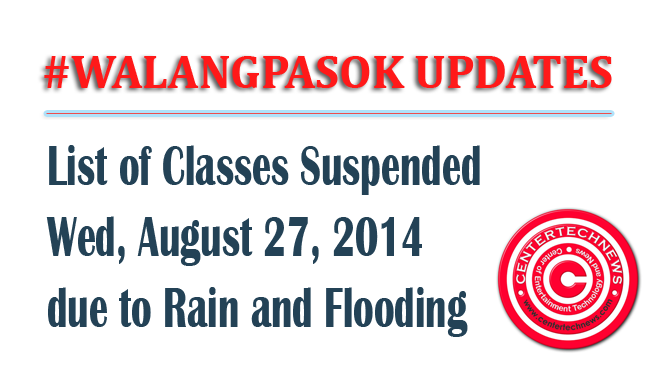 We will post updates on this page if new information were available for #WalangPasok Suspension of Classes for 27 August, 2014 Updates.